Ruth is an artist working in mixed-media installation, placing particular emphasis on Printmaking and Artists’ Books. 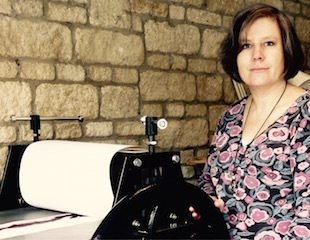 She has a broad skills base, which includes letterpress printing, bookbinding, sculpture, film and photography. Ruth’s work can be situated in a social/political framework. She deals most specifically with the visual articulation of that which has been hidden or denied. This involves the archiving of past hurts, coupled with documentation of the point at which they re-surface. Always adopting language and text as the starting point, authenticity is key to her artistic practice, drawing as she does upon life experiences for her source material. Additionally, Ruth is fascinated with the parallels that can be drawn between psychoanalytic theory and artistic practice. Working with the intention that her work be received on different levels; the aesthetic is important, but Ruth also enjoys layering. This is borne out of her interest with the visible/invisible. As a result of her curiosity with that which is hidden, Ruth is currently engaged with the concerns abound in our prevailing ‘wound culture’, or the current morbid fascination within our society for a public opening and showing of emotional wounds. Working with such materials involves such issues as the role of the victim/perpetrator, self and other, interdependence, alienation, family relationships and reflection upon the identities we try on. Theoretically, Ruth is informed by the writings of Suzi Gablik, James Hillman and Theodore Roszak. She shares with them an interest in the role art has had to play in shaping society’s reality, but more importantly, the potential it has for providing us with a new paradigm. This fuels her concerns with community-based projects. Like Suzi Gablik, Ruth believes that it is essential that artists create with responsibility. For Ruth, creating with responsibility means maintaining a careful balance between finding artistic solutions which are true to her intent as an artist (authenticity), whilst concurrently addressing the needs of the viewer.